Samples that would have been difficult if not impossible to analyze on traditional small element diamond ATR accessories are now simple to do on the DuraScope. In addition to all of the advantages of the small element diamond ATR element, the DuraScopeTMincorporates a video camera beneath the diamond for assistance in positioning of the sample and observing contact between the sample and the diamond. For the first time, the power of these two techniques has been combined in a system that works in the sample compartment of the FT-IR. The addition of the video camera with output to a PC video board allows image manipulation and control that had been seen before only on infrared microscopes. Being able to see the sample allows the user to select discrete areas for analysis while ignoring others. This technology offers many advantages to the FT-IR user. Infrared spectral analysis, using ATR, is gaining wide acceptance among chemists because these FT-IR accessories are a unique interface for solid and liquid samples . Diamond ATR has all of the advantages of traditional ATR in addition to some unique benefits . In addition to being a very versatile analysis system for large samples, this technique has been referred to as a poor mans’ microscope . Diamond ATR accessories are microanalysis devices. The high cost of cutting and polishing the diamond ATR element to the required shape and the requirement to minimize the pathlength of the infrared beam in the diamond imposes a practical limit on the size of the sensing element surface. To offer affordable accessories with minimal spectral interference from the ATR element itself, diamond ATR manufacturers offer systems that have sensing surfaces approximately 1 mm in diameter. A variety of innovative optical designs concentrate 15-30% of the spectrometer energy through these small diamond elements (Figure 1). As a result, sample size requirements for ATR have been reduced by more than 100X over traditional 45 degree ZnSe ATR systems. Achieving intimate contact with the diamond element is critical for successful ATR analysis. Using small ATR diamond elements, it is much easier to achieve contact as element size decreases. As Lewis and Sommer point our, ” Since pressure is a force divided by area, the pressures obtainable in a micro-configuration can be four to five times greater for equal applied pressure. The reduced area also provides uniform pressure, eliminating baseline distortions associated with uneven pressure across much larger internal reflection elements”. Everyone using ATR accessories has experienced the futility of getting a quality spectrum of a powder on a large 6-reflection ZnSe crystal. Single crystals of this same powder are now routinely analyzed on small element diamond ATRs. Only the users’ eyesight, patience and steadiness of hand limit the sample size. Small element single and multi-reflection diamond ATRs have an active area in the center of the diamond. Samples larger than 500 microns will usually cover the entire diamond after compression. As a result, sample positioning is not as critical. However, as users try for smaller and smaller samples, it becomes important to position the sample accurately in the center and make sure that it stays in place when it is compressed. Samples as small as 20 microns are now possible . Most pressure devices prevent the user from seeing the sample positioned on the diamond (Figure 1). Unable to see, the user can not observe shifting of the sample on the active area of the diamond (and sometimes across the room). The DuraSamplIRTM configuration, as represented in Figure 1 is the basis for the universal ATR  offered by Perkin Elmer in their new Spectrum OneTM FT-IR spectrometer and the SmartTM DuraSamplIR offered by Nicolet in the new AvatarTM FT-IR spectrometer. 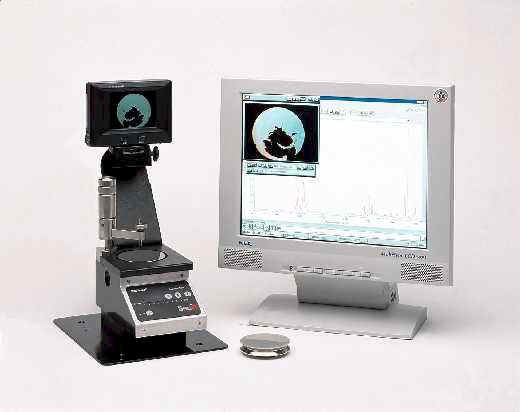 At PittCon 1998, SensIR Technologies introduced the ViewIRTM. 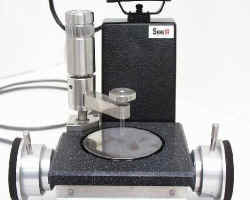 The ViewIR allows a user to look through the pressure device, position the sample in the active area of the diamond and watch the sample being compressed (Figure 2). 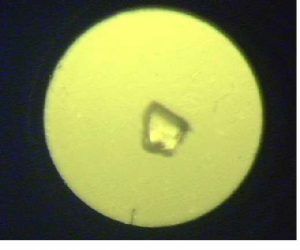 The DuraScope (SensIR Technologies, Danbury, CT) is a small element diamond ATR accessory that views through the diamond so that sample-to-diamond contact is directly observed (Figure 3). One of the advantages of the SensIR Technologies diamond ATR design is that the element is neither faceted nor a prism. The diamond element is flat on both sides. In addition, the ZnSe focusing crystal is visibly transparent. This allows the placement of a high-resolution miniature CCD camera beneath the diamond.Apparent contact with the sample is observed as a “wetting” effect on the glass pressure plate. It is assumed that the samples behave as hydrostatic fluids and therefore the same effect is occurring on the reverse side between the sample and the diamond interface. The ViewIR is ideal for small contaminants that have been removed from a matrix such as black inclusions in a white pharmaceutical tablet in addition to single crystals and single fibers. However, samples that continue to provide a challenge are opaque samples, ink on paper etc. In essence, samples that can not be seen through or around are not suitable for the ViewIR. To address this problem, a new accessory developed. Now it is possible to observe the samples’ contact with the diamond instead of contact with the glass pressure device as the user is actually looking through the diamond. In addition, a key feature of this design is the 30-100X magnification provided by the camera. The electronics of the camera compensate for the yellow color of the ZnSe focusing element. The camera focus is set at the diamond-sample interface. Samples are in focus as soon as they are placed on the diamond. Positioning the sample on the diamond is greatly aided by a high quality video image displayed on the integrated video monitor. Sample-to-diamond contact is observed as a wetting effect and appears as a visible change in sample size and transparency. Different areas of the sample can be selectively analyzed through careful positioning and compression. The sample press has interchangeable sample compression tips for optimal analysis. For example, a clear plastic tip serves as an illuminator for transparent samples by focusing ambient light behind the sample, a concave stainless steel tip is included for pellets etc. An integrated force readout system allows the user to reproducibly return to the same pressure each time in addition to having both a visual and audible force overload alarm. This is achieved using a LED display (Figure 4). As the pressure increases, more of the LEDS are illuminated. The red LED indicates that no more pressure should be applied. A 4 inch video monitor is standard on the DuraScope system. In addition, the DuraScope has outputs for additional NTSC and S-Video (Figure 5) through the use of the electronics interface module. This allows photodocumentation and report generation through the use of an optional PC video card. All that is required is the connecting cable to the PC. Options such as extended spectral range to 230 cm-1 are available through the use of KRS5 as the focusing element instead of ZnSe. An additional benefit of the SensIR Technologies design is that multiple reflection configurations are possible through the use of an air gap between the diamond and the ZnSe in specific locations. This refractive index difference between the diamond and the air pocket cause additional internal reflections. This multi-reflection option is ideal when enhanced sensitivity is required. The diamond element in this configuration is approximately 3 mm so all of the advantages of a small element ATR are still retained. Analyzing ink on paper is a challenging sample for most small element diamond accessories. A readily available example of a sample that would be difficult on a single reflection diamond ATR (or multi-reflection, for that matter) is the ink on a business card. The card must be turned so that the ink side faces down. This allows the ink to touch the diamond ATR element but makes it virtually impossible to see if the ink is correctly positioned on the ATR element. To perform this analysis on a non-viewing diamond ATR such as the DurasamplIR, substantial sample preparation was undertaken. The area that corresponded to the sample on the reverse side of the card was marked. Then, the business card was placed, ink down, on the sample and the locating mark was centered in the ViewIR. Pressure was applied. However, only a spectrum of paper was obtained. 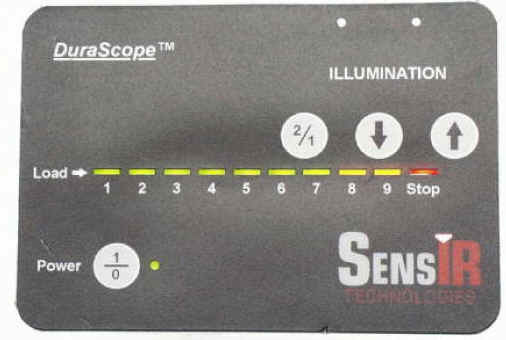 Using the DuraScope, ink dots on paper are easy to find, document and analyze (Figure 8). This analysis was performed on an Avatar FT-IR (Nicolet Instrument Corporation, Madison, WI) using a DTGS detector. 32 scans were collected. A reference spectrum of the paper was collected for subtraction purposes. The ink dot, as seen through the diamond, is approximately 500 microns. The field of view through the diamond is 1.5 mm. Sample positioning and contact with the diamond was observed on the integrated 4-inch color monitor. The images were captured using a commercially available video capture board. The sample is illuminated from beneath the diamond using fiber optic illuminators. Two light sources are provided and the intensity of the illumination is variable. In addition, one or both illuminators can be toggled on and off to increase contrast in the image. Because of the increased demand for both rapid and documented analysis of evidence in criminal investigations, micro-ATR is a method of choice for the forensic scientist. One of the proven applications for micro-ATR devices is forensics. Samples such as drugs, paint chips, fibers and all unknowns can be analyzed on the diamond without fear of damage to the ATR element. With the addition of viewing, an image of the sample can be saved with the spectral file for archival purposes. In addition, a key feature of the DuraScope is the ability to view contamination on the crystal. The focus of the camera is set at the diamond surface so even minute traces of sample are easily observed and cleaned. In this example, a single crystal of powder (sugar in this example) was placed on the diamond and compressed. The transparent area in the image of the compressed crystal indicates that intimate contact has been achieved. LSD analysis has proven to be a difficult sample to analyze because in street form, concentrations are quire low. The most popular distribution method is as “stamps” where the LSD is deposited onto paper tabs. The user can then lick the LSD from the back of the “stamp”. The usual method of analysis is to extract the LSD using a solvent such as chloroform. The sample is then analyzed using a GC/MS. This method is difficult and time consuming. A novel method was employed by Harris using a wick and capillary action . The LSD was allowed to migrate up the wick where it crystallized overnight and was picked off for infrared microscopy. While still an improvement over GC/MS, it was still time-intensive. An alternative method is described here. 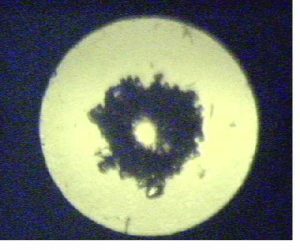 2 microlitres of street sample dissolved in chloroform were deposited on a multi-reflection diamond ATR DuraScope using a GC syringe. The chloroform evaporated in less than ten seconds, allowing the LSD to crystallize out onto the diamond. A spectrum was collected and the crystal was wiped clean with an appropriate solvent. Collection and cleaning took less than one minute. Combinatorial chemistry is a powerful technology that allows chemists to quickly and inexpensively produce many different chemicals and evaluate their activity [7, 8]. A common substrate for this reaction is a polymer bead with a linker site. To illustrate the capability of the DuraScope for this field, individual beads with different linker sites were analyzed. The difference between these beads, in the carbonyl region, is shown below (Figure 11). These beads are approximately 100 micrometers in diameters and would be very difficult to manipulate and observe without the viewing enhancement that the DuraScope or an FT-IR microscope provides . Notice the difference in illumination between the sample, before and after compression. The sample compression tip in this example is a glass rod. It serves as a light conduit and focuses ambient light at the back of the crystal. In the uncompressed image, the pressure device has been rotated completely out of the way for easy access to the sample area. As a result, there is no enhancement in the illumination behind the sample.These beads are approximately 100 micrometers in diameters and would be very difficult to manipulate and observe without the viewing enhancement that the DuraScope or an FT-IR microscope provides . Hair represents a challenging sample . It is a hard sample, is thick and is strongly absorbing. As a result, it is a difficult transmission sample. The DuraScope handles such a sample easily. In this instance, the surface treatment of the hair was of interest. By comparing an untreated hair to a treated hair, it was an easy task to obtain a quality spectrum of the surface treatment. To collect a sample spectrum with the DuraScope, simply place the sample on the diamond and position it in the center. The integrated video monitor aids in this step. Rotate the pressure arm into position over the diamond and apply pressure by turning the steel post. Observe contact and then initiate scanning. That’s all there is to it. By allowing the analyst to view through the diamond element of the ATR accessory The DuraScope offers capability to the FT-IR user that has never before been available in an in-compartment FT-IR accessory. The DuraScope offers all of the capabilities that were once reserved for those users who had ATR objectives on infrared microscopes . In addition to allowing analysis that was previously impossible, the DuraScope brings simplicity and ease of use to samples that were possible but difficult. The ideal analysis technique has improved.